We have developed an integrated and interactive governance structure composed of committees, cores, and platform teams to oversee the implementation of the network. The CanHepC General Assembly is comprised of all members of the Network, including researchers, trainees, knowledge-users, collaborators, and partners. For a complete list of all the CanHepC members and contacts details please refer to the directory in the Member’s page. 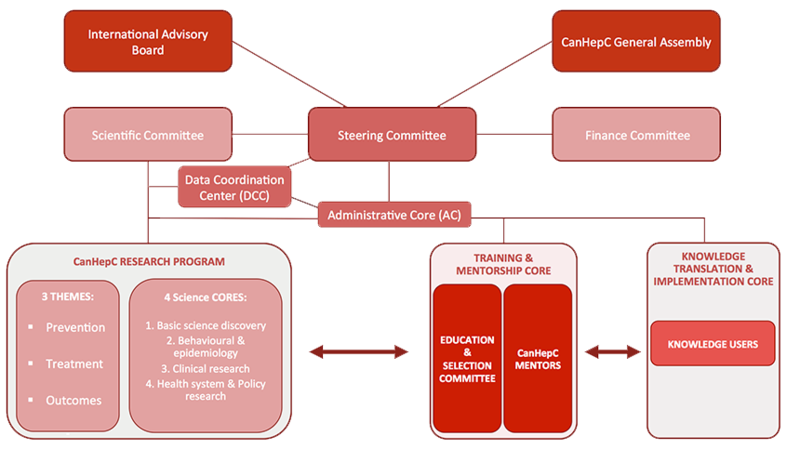 The CanHepC Steering Committee is composed of the 6 CanHepC Principal Investigators representing the six cores and the Project Manager. As the governing body of the network, the Steering Committee is responsible for operational decision-making and overall administration over a wide range of scientific and management issues. The CanHepC Scientific Committee is composed of two members from each core in addition to the core leads. The Scientific Committee is responsible for setting research priorities and approving projects. This CanHepC Finance Committee is responsible for monitoring the network finances and allocating resources to meet the specific objectives. The Administrative Core is responsible for efficient communication across all cores, supporting the development of the proposed research and training activities, and monitoring the progress of each objective. The Data Coordination Centre will facilitate development of data inventory harmonization, access, and use of the CanHepC data and relevant biobanks to meet the objectives of the approved research projects. An International Advisory Board composed of world-class scientific and knowledge translation experts in areas related to the network’s activities and objectives will review, advise and assess the progress and direction of the Network, both in terms of research and knowledge translation. © 2019 CanHepC - Canadian Network on Hepatitis C. All Rights Reserved.